1955: Jobs is born on Feb. 24, in San Francisco and was adopted by Paul and Clara Jobs (née Hagopian) of Mountain View, California, who named him Steven Paul. 1972: Jobs graduated from Homestead High School in Cupertino, California, and enrolled in Reed College in Portland, Oregon. Although he dropped out after only one semester, he continued auditing classes at Reed, such as one in calligraphy. 1974: Jobs returned to California and began attending meetings of the Homebrew Computer Club with Steve Wozniak, a high school friend who was a few years older. He works for video game maker Atari. 1976: Apple Computer is formed on April Fools’ Day, shortly after Wozniak and Jobs create a new computer circuit board in a Silicon Valley garage. The third founder, Ronald Wayne, was serving as the venture’s “adult supervision”. He drew the first Apple logo, wrote the three men’s original partnership agreement, and wrote the Apple I manual. He soon gave up his share of the new company for a total of $2,300 becaus he was afraid of the financial risk. The Apple I computer went on sale by the summer for $666.66. 1977: Apple is incorporated January 3, 1977 by its founders and a group of venture capitalists (Mike Markkula et al.). The company unveils Apple II, the first personal computer to generate color graphics. Sales soar to the rate of $1 million a year. 1978: Jobs’ daughter Lisa is born to girlfriend Chrisann Brennan. She briefly raised their daughter on welfare when Jobs denied paternity, claiming that he was sterile; he later acknowledged paternity. In 1983 he named the “Apple Lisa” after his first daughter. 1979: Jobs and several Apple employees including Jef Raskin visited Xerox PARC in December 1979 to see the Xerox Alto. Xerox granted Apple engineers three days of access to the PARC facilities in return for the option to buy 100,000 shares (800,000 split-adjusted shares) of Apple at the pre-IPO price of $10 a share. Jobs was immediately convinced that all future computers would use a graphical user interface (GUI), and development of a GUI began for the Apple Lisa. 1980: Apple goes public on December 12, raising $110 million in one of the biggest initial public offerings to date. Apple generated more capital than any IPO since Ford Motor Company in 1956 and instantly created more millionaires (about 300) than any company in history. 1982: Annual sales climb to $1 billion. 1983: Steve Jobs began working on the Apple Lisa in 1978 but in 1982 he was pushed from the Lisa team due to infighting, and took over Jef Raskin’s low-cost-computer project, the Macintosh. A turf war broke out between Lisa’s “corporate shirts” and Jobs’ “pirates” over which product would ship first and save Apple. Lisa won the race in 1983 and became the first personal computer sold to the public with a GUI, but was a commercial failure due to its high price tag and limited software titles. “Do you want to sell sugar water for the rest of your life or do you want to come with me and change the world?” Steve Jobs lures John Sculley away from Pepsico Inc. to serve as Apple’s CEO. 1984: Apple launches the Macintosh on January 22, 1984. Its debut is announced by the now famous $1.5 million television commercial “1984”. It was directed by Ridley Scott, aired during the third quarter of Super Bowl XVIII, and is now considered a watershed event for Apple’s success and a “masterpiece”. The Macintosh initially sells well, but follow-up sales are not strong due to its high price and limited range of software titles. The machine’s fortunes changes with the introduction of the LaserWriter, the first PostScript laser printer to be offered at a reasonable price, and PageMaker, an early desktop publishing package. The Mac is particularly powerful in this market due to its advanced graphics capabilities, which had necessarily been built in to create the intuitive Macintosh GUI. 1985: A power struggle developes between Apple Co-Founder Jobs and Apple CEO John Sculley. The Apple board of directors instruct Sculley to “contain” Jobs and limit his ability to launch expensive forays into untested products. Rather than submit to Sculley’s direction, Jobs attempts to oust him from his leadership role at Apple. Sculley finds out that Jobs had been attempting to organize a putsch and calls a board meeting at which Apple’s board of directors sided with Sculley and removes Jobs from his managerial duties. Jobs resignes from Apple and sells all of his Apple stocks – except for one. Steve Wozniak also de facto resigns from Apple. Officially he returned to Apple product development, desiring no more of a role than that of an engineer and a motivational factor for the Apple workforce. 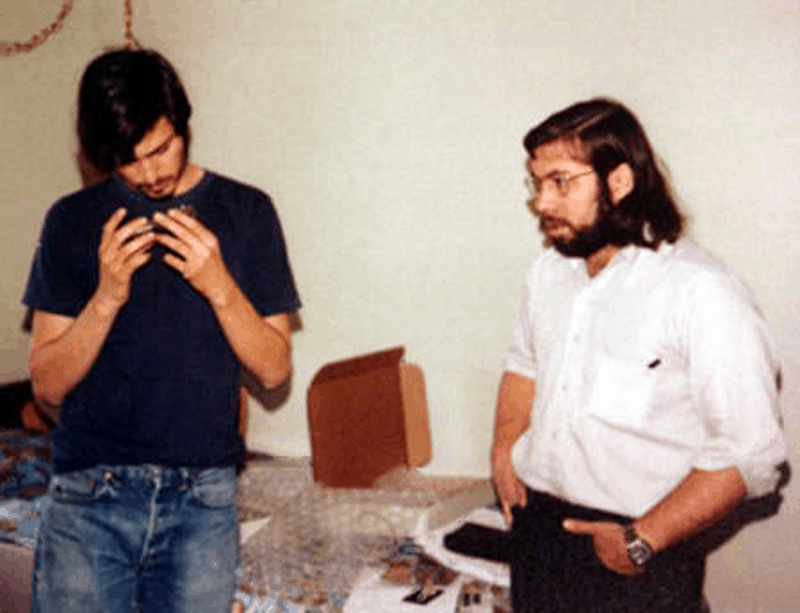 Wozniak permanently ended his full-time employment with Apple on February 6, 1987, 12 years after having created the company. He still remains an employee (and receives a paycheck), and is a shareholder. 1986: Steve Jobs invests ten million dollars in the computer graphics division of George Lucas, which became Pixar later. He also founds Next Inc., a new computer company making high-end machines for universities. 1989: First NeXT computer goes on sale with a $6,500 price tag. Like the Apple Lisa, the NeXT workstation was technologically advanced; however, it was largely dismissed by industry as cost-prohibitive. Among those who could afford it, however, the NeXT workstation garnered a strong following because of its technical strengths, chief among them its object-oriented software development system. Jobs marketed NeXT products to the scientific and academic fields because of the innovative, experimental new technologies it incorporated (such as the Mach kernel, the digital signal processor chip, and the built-in Ethernet port). 1991: Apple and IBM Corp. announce an alliance to develop new PC microprocessors and software. Apple introduces the PowerBook, which established the modern form factor and ergonomic layout of the laptop computer. 1993: Apple introduces the Newton, a hand-held, pen-based computer. It was Apple’s first foray into the PDA markets, as well as one of the first in the industry. Despite being a financial flop at the time of its release, it helped pave the way for the Palm Pilot and Apple’s own iPhone and iPad in the future. Apple reports quarterly loss of $188 million in July, and CEO Sculley is replaced by Apple president Michael Spindler. Apple restructures and Sculley resigns as chairman. At Next, Jobs decides to focus on software instead of whole computers. 1994: Apple introduces Power Macintosh computers based on the PowerPC chip it developed with IBM and Motorola. Apple decides to license its operating software, allowing other companies to clone the Mac. 1995: The first Mac clones go on sale. Microsoft Corp. releases Windows 95, which is easier to use and more like the Macintosh. Apple struggles with competition, parts shortages and mistakes predicting customer demand. Pixar’s “Toy Story,” the first commercial computer-animated feature, hits theaters and Pixar goes to Wall Street with an IPO that raises $140 million. 1996: Gil Amelio replaces Michael Spindler as CEO on February 2, 1996. Apple announces on December 10, 1996 to buy Next for $430 million, and its NeXTstep operating system Jobs’ team developed. This deal would not only bring Steve Jobs back to Apple’s management, but NeXT technology would become the foundation of the Mac OS X operating system. 1997: Steve Jobs returns to Apple as an adviser, then appointed “interim” CEO after Amelio is pushed out on on September 16, 1997. 1998: Apple returns to profitability and unveils the iMac. This computer integrated a CRT display and CPU into a streamlined, translucent plastic body. The line became a sales smash, moving about one million units a year. It also helped re-introduce Apple to the media and public, and announced the company’s new emphasis on the design and aesthetics of its products. Apple discontinues the Newton on February 27, 1998. 2000: At the 2000 Macworld Expo, Jobs officially dropped the “interim” modifier from his title at Apple and became permanent CEO. 2001: In October 2001, Apple introduces its first iPod portable digital audio player. The iPod started as a 5 gigabyte player capable of storing around 1000 songs. Since then it has evolved into an array of products including the Mini (now discontinued), the iPod Touch, the Shuffle, the iPod Classic, the Nano, and the iPhone. Apple introduces Mac OS X, the modern Mac operating system based on NeXT’s NeXTstep and incorporating parts of the FreeBSD kernel. Aimed at consumers and professionals alike, Mac OS X marries the stability, reliability and security of Unix with the ease of a completely overhauled user interface. To aid users in transitioning their applications from Mac OS 9, the new operating system allows the use of Mac OS 9 applications through the Classic environment. 2003: Apple launches the iTunes music store with 200,000 songs, giving people a convenient way to buy music legally online. Unlike other fee-based music services, the iTunes Store charges a flat US$0.99 per song (or US$9.99 per album). Users have more flexibility than on previous on-line music services. For example, they can burn CDs including the purchased songs (although a particular playlist containing purchased music may only be burned seven times), share and play the songs on up to five computers, and, of course, download songs onto an iPod. It sells 2 million downloads in only 16 days. 2004: In mid-2004, Jobs announces to his employees that he had been diagnosed with a cancerous tumor in his pancreas. The prognosis for pancreatic cancer is usually very poor; Jobs, however, says that he had a rare, far less aggressive type known as islet cell neuroendocrine tumor. After initially resisting the idea of conventional medical intervention and embarking on a special diet to thwart the disease, Jobs underwent a pancreaticoduodenectomy (or “Whipple procedure”) in July 2004 that appeared to successfully remove the tumor. During Jobs’ absence, Timothy D. Cook, head of worldwide sales and operations at Apple, ran the company. 2005: At the Worldwide Developers Conference keynote address on June 6, 2005, Steve Jobs announces that Apple would begin producing Intel-based Mac computers. On January 10, 2006, the first Intel-based machines, the iMac and MacBook Pro, were introduced. They were based on the Intel Core Duo platform. This introduction came with the news that Apple will complete the transition to Intel processors on all hardware by the end of 2006, a year ahead of the originally quoted schedule. At the Stanford university’s 114th Commencement on June 12, 2005 Steve Jobs urged graduates to pursue their dreams and see the opportunities in life’s setbacks — including death itself. 2006: Disney buys Pixar for $7.4 billion. Jobs becomes Disney’s largest individual shareholder with approximately 7% of the company’s stock, and much of his wealth is derived from this sale. 2007: Delivering his keynote speech at the Macworld Expo on January 9, 2007, Jobs announces Apple’s its first smartphone. The following day, Apple shares hit $97.80, an all-time high at that point. In May, Apple’s share price passed the $100 mark. The iPhone is released on June 29, 2007. Crowds camp overnight at stores to be one of the first to own the new device. 2008: Speculation mounts that Jobs is ill, given his weight loss. Apple officials stated Jobs was victim to a “common bug” and was taking antibiotics, while others surmised his cachectic appearance was due to the Whipple procedure. During a July conference call discussing Apple earnings, participants responded to repeated questions about Steve Jobs’ health by insisting that it was a “private matter.” Others, however, voiced the opinion that shareholders had a right to know more, given Jobs’ hands-on approach to running his company. The New York Times published an article based on an off-the-record phone conversation with Jobs, noting that “while his health issues have amounted to a good deal more than ‘a common bug,’ they weren’t life-threatening and he doesn’t have a recurrence of cancer.” In September he kicks off an Apple event and says, “The reports of my death are greatly exaggerated,” making a play off a famous Mark Twain quote after Bloomberg News accidentally publishes, then retracts, an obituary that it had prepared in advance. 2009: Jobs explains severe weight loss by saying he has a treatable hormone imbalance and that he will continue to run Apple. Days later he backtracks and announces he will be on medical leave. He returns to work in June. Later it is learned that he underwent a liver transplant at Methodist University Hospital Transplant Institute in Memphis, Tennessee. 2010: After years of speculation and multiple rumored “leaks” Apple announces a large screen, tablet-like media device known as the iPad on January 27, 2010. The iPad runs the same touch based operating system that the iPhone uses and many of the same iPhone apps are compatible with the iPad. This gave the iPad a large app catalog on launch even with very little development time before the release. Later that year on April 3, 2010, the iPad was launched in the US and sold more than 300,000 units on that day and reaching 500,000 by the end of the first week, giving rise to a new category of modern touch-screen tablet computers. In May 2010, Apple’s market cap exceeded that of competitor Microsoft for the first time since 1989. Jan. 17, 2011: In an internal memo to Apple employees, Jobs announces a second medical leave with no set duration. Chief Operating Officer Tim Cook will fill in to run day-to-day operations. Jobs said he will continue as CEO and will be involved in major decisions. August 24, 2011: Steve Jobs resigns his position as Chief Executive Officer of Apple. He is replaced by longtime Chief Operating Officer Tim Cook, and Jobs is now Apple’s chairman. Prior to this, Apple did not have a chairman and instead had two co-lead directors, Andrea Jung and Arthur D. Levinson, who continue with those titles. October 5, 2011: Jobs dies at his Palo Alto, California, home around 3 p.m., due to complications from a relapse of his previously treated islet-cell neuroendocrine pancreatic cancer, resulting in respiratory arrest. He had lost consciousness the day before, and died with his wife, children, and sisters at his side. Both Apple and Microsoft flew their flags at half-staff throughout their respective headquarters and campuses. Bob Iger ordered all Disney properties, including Walt Disney World and Disneyland, to fly their flags at half-staff from October 6 to 12, 2011. October 7, 2011: A small private funeral is held, of which details were not revealed out of respect to Jobs’s family. Jobs is buried in an unmarked grave at Alta Mesa Memorial Park, the only non-denominational cemetery in Palo Alto. He is survived by Laurene, his wife of 20 years, their three children, and Lisa Brennan-Jobs, his daughter from a previous relationship. October 19, 2011: A private memorial service for Apple employees is held on the Apple Campus in Cupertino. Present were Cook, Bill Campbell, Norah Jones, Al Gore, and Coldplay, and Jobs’s widow, Laurene. Some of Apple’s retail stores closed briefly so employees could attend the memorial. This entry is published under the GNU General Public License.